Business 1st the coasts leading Business Networking group are proud to be hosting their annual Charity event. This year, they are hosting a Psychic Dinner in aid of FAMA our local Dog charity. Business 1st and its members hope to raise a sufficient amount of money to enable FAMA and its army of volunteers to continue to provide this vital service to all those animals that find themselves without a home. The people behind FAMA truly are incredible. The event will take place on Saturday the 13th of November and promises to be an evening to remember. 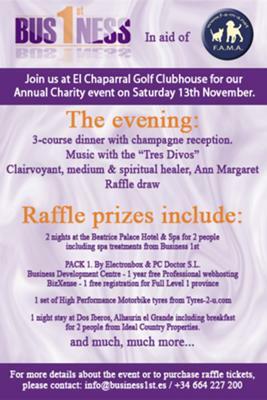 A three course dinner with champagne reception (Menu details below), music by the amazingly talented Tres Divos, it will also give all those attending the opportunity to experience another realm with UK based Ann Margaret, an internationally recognised clairvoyant, medium and spiritual healer. The evening will be rounded off with the Raffle draw which has the full list of prizes and sponsers at the end of the post. A special thanks to all that donated!